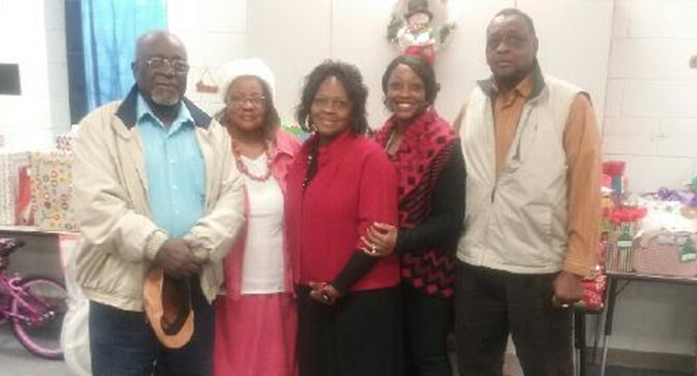 Douglas Elementary School hosted a Secret Santa Appreciation Breakfast, Dec. 15, for members of the community that sponsored their initiative to provide families in need with additional help this holiday season. A total of 19 families were served this year, and out of those families, fifty-five children received items off their wish lists. “The community has been awesome,” said Shonda Raiford, DES Guidance Counselor who spearheaded the event. This was the second year DES provided a Secret Santa for their students. As Raiford explained, teachers were asked to identify students whose families they thought might need a little extra help at Christmas time. Those families were then contacted and asked if they would like to receive help. While some declined, nineteen accepted; fourteen more than the previous year. Sponsors provided such as items as bikes, coats, toys, food (including turkeys), household items, and tablets. One sponsor even provided rent for a family that was facing eviction. Raiford said that the sponsors “pretty much delivered” what was on each child’s wish list. This year’s sponsors included the deacons, trustees, and Senior Choir of Science Hill Missionary Baptist Church, Trenton Correctional Institution, Mt. Calvary Lutheran Church, Episcopal Church of the Ridge, Thomas McCain and the Carey Hill Missionary Baptist Church, Trenton UMC, the Career Center at Strom Thurmond High School, Mrs. Burton and Strong Tabernacle Pentecostal Church, the Williams Foundation and Tanya Thompson, the Kennedi Foundation – Mrs. Stover, Mrs. Joplin, Mr. Lott, Kelvin Butler Jr., and Mrs. Roton. Raiford shared that many of this year’s sponsors are already looking forward to helping with the Secret Santa project again next year. She said it is the school’s goal to be able to serve even more families next Christmas. If you or your organization is interested in participating, please call DES at 275-1752.